The millennials in the office LOVED the original (OG) Pokémon, and could at least get 50-75 of the original 151 right if we tried. Since the release of the new mobile app/game Pokemon Go, we’ve been searching out the places closest to us to try and catch ‘em all! 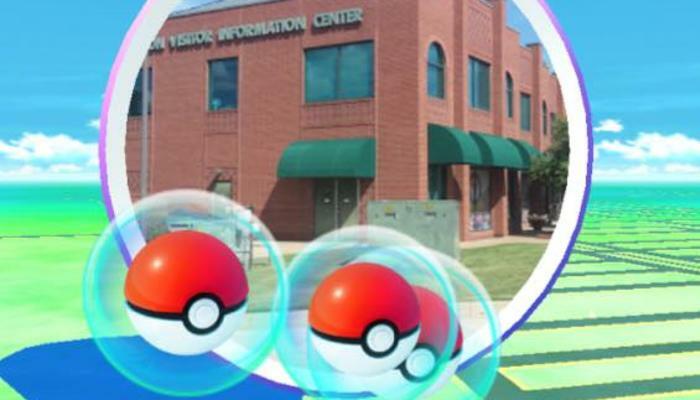 Stop by our Pokéstop in our Visitors Welcome Center, there might be an egg (we know we keep getting three poké balls every few minutes woo)! For sure though, if you stop by our VWC, sign our guestbook, and we’ll have a FREE APPETIZER coupon for Mellow Mushroom Pizza, which is also a Pokéstop! Go to a Rangers Game – There are THREE in Globe Life Park + 2 gyms! Globe Life Park is a Pokéstop in itself – that one is easy. But, you’ll have to take a tour of Globe Life Park or attend a game there to get the two (or more) lurking inside. The Nolan Ryan Statue is a Pokéstop, and there’s also a mysterious “Classic Texas Rangers” Pokéstop and another, but we’re not going to tell you where those are. It just looks like it’s somewhere on the outside of the park. Wink. Tour AT&T Stadium, it has THREE GYMS!!! Outside of AT&T Stadium, there is a Pokéstop or two. Then take a tour of the stadium to obtain the stops inside! Visit Six Flags Over Texas – there are three gyms and 26 stops. If you have a season pass, or you’re just there for the day – go into Six Flags Over Texas. We’re sure there will be Pokémon everywhere!!!! Plus, the good ol’ Oil Derrick is a gym. Meet some new friends and challenge them to battle. The park itself is a Pokéstop. Then, it’s your job to find the multiple others. We’re sure Lincoln Square is teeming with Pokéstops. Walk around and enjoy some food at Boomer’s then stroll the lifestyle center to see what other treasures await. Stay tuned, as we will find more and update this post!